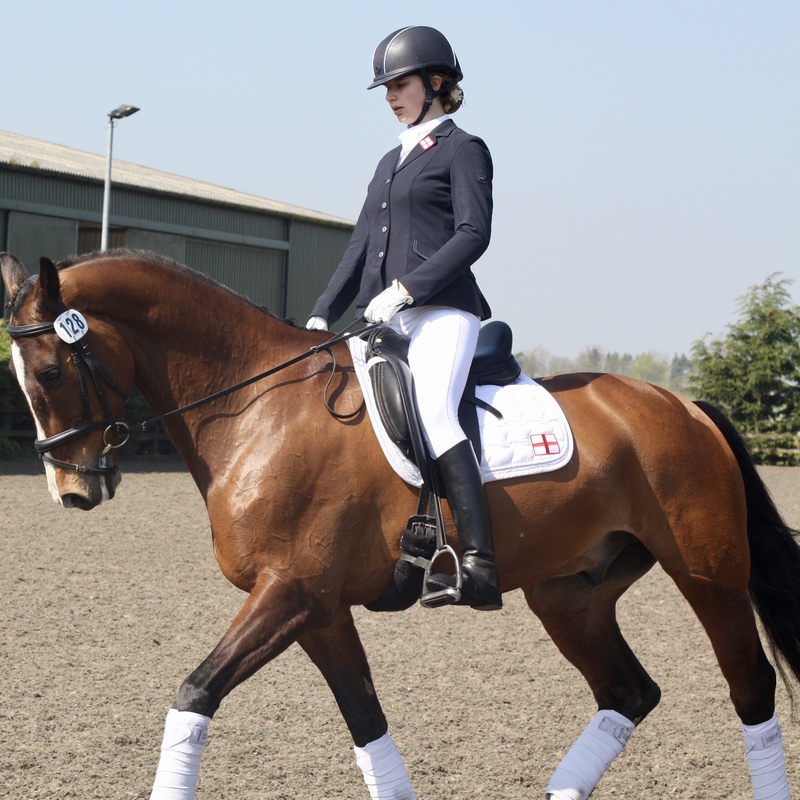 We were straight into April with a visit to Vale View competing for the first time for the Central Region in the Para Home International. We travelled up on the Friday afternoon to settle Aslan into his temporary accommodation for the weekend and had a good warm up session in beautiful conditions. It was nice to catch up with old friends and competitors and to meet my Central team mates Julie Payne and Sara Bates. Then it was the opening ceremony and the emotion of hearing the National Anthem at a competition for the first time, followed by opportunity to relax over a fish and chip supper with all the teams to round the day off. After an early arena walk on the Saturday Morning was an opportunity to ride a Summer Qualifier in the Home Arena before the Home International kicked off. 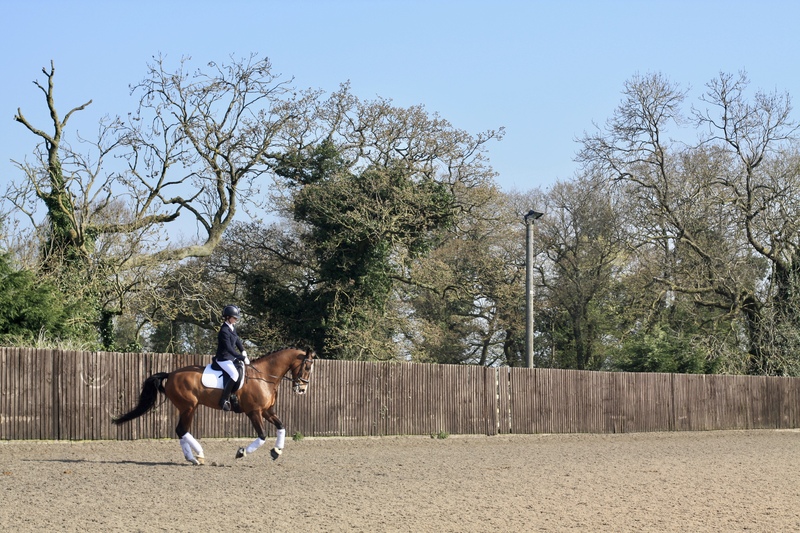 Aslan warmed up beautifully in the beautiful sunshine and took everything into the arena for me. We held our focus and rhythm, kept going forward and gained a personal best with a score for the 2017 Grade IV Novice of 71.03%. Great start to the weekend, and six points of the 12 needed towards the Summers from one ride! Saturday afternoon was the first round of the Para Home International which meant I got to wear the National Flag for the very first time. I am half Dutch, half Scottish and part Welsh but riding under the cross of St George of England was no less of a thrill. This time we were riding in the International Arena riding in front of two judges, and Aslan was on form again in the warm up. The International Arena is not Aslan’s favourite and with a bit of a spook at the judges before the bell he was clearly on edge. He settled a bit and while he was still a bit edgy he went better and better as the test progressed, with only the odd trip or so giving us away. 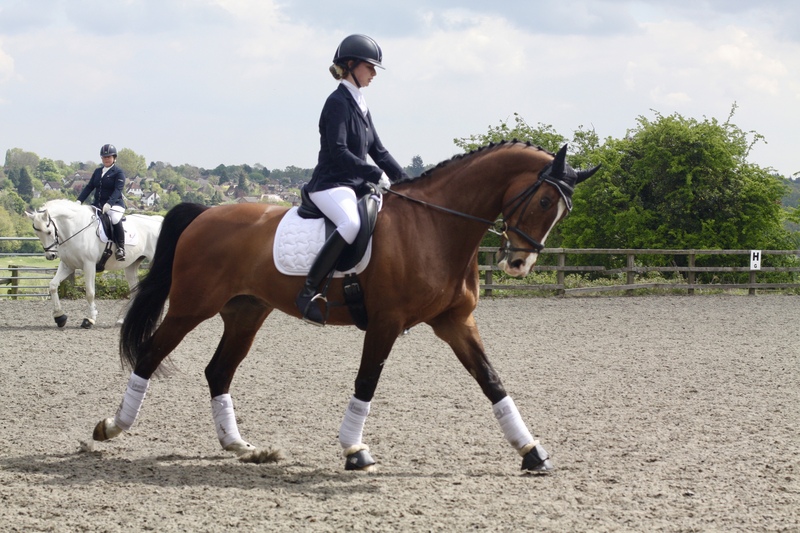 The judge at C gave us 70.34% but H was not so convinced giving us a pretty ordinary 60.0%, so a big split in opinions which resulted in us getting 65.17% over all, and an OK if not spectacular contribution to the team score. The odds were against us with only three members to our team rather than the usual four, and not being able to drop a score like all the other teams. Never mind, we all like a challenge and Sara and Julie put in great rides putting us in third position overnight, out of the nine regional teams competing. Saturday night was time relax with the whole family and Sacha all part of the Central team on with everyone sleeping on the lorry for the first time and even Molly and Pucker behaving and getting on together. The fantastic warm sunny weather held through to the Sunday for the final day of competition. We started better with Aslan more comfortable in front of the judges and gallery than on day one. But something unsettled him into our first medium at F which clearly played on his mind, as once we were back at that end of the school we had another spooky transition to canter too. There is not much room for error in the Novice tests as they are scored out of just 220 so, with a couple of bad transitions, it was never going to be a great score and we ended up with a disappointing 62.84%. It was a reminder to me that it’s my job to settle Aslan and be one step ahead of him and reassure him by reacting to distractions before he does to keep him settled. Two more brilliant rides from Sara and Julie kept us in it right to the end, but inevitably we dropped a place to fourth and just missed out on a podium position. Incredibly only 1% separated the top four teams and a tough reminder of what might have been. We didn’t win but I did gain two fantastic team mates in Sarah and Julie and I survived my first Para Home International. After the excitement of Vale View, it was back to business at home, a local competition at Windmill Farm and an opportunity to ride the 2017 Team Test for the first time. It’s a big step up form Novice with the addition of lots of new and more complicated school movements such as rein back, 10m canter loops, 20m circles in medium canter, shoulder in, turn on the haunches and canter-trot-canter transitions to change the rein so it’s pretty challenging and exiting to ride. First though the Novice test, and with a solid 67.76% another six points and confirmation of the 12 I needed for qualification for the Summer Para Festival at Solihull. With the pressure off, we could relax and enjoy our very first Team Test and as I came down the centre line for the first time it felt quite special that this was my very first gold test, and the same one I will ride at International competitions at the highest level. The relaxation clearly helped, Aslan went brilliantly and helped me through the emotion of it and I surprised myself with an amazing 68.38% and a qualifying score for the 2* competition at Bishop Burton. Aslan I owe you one! 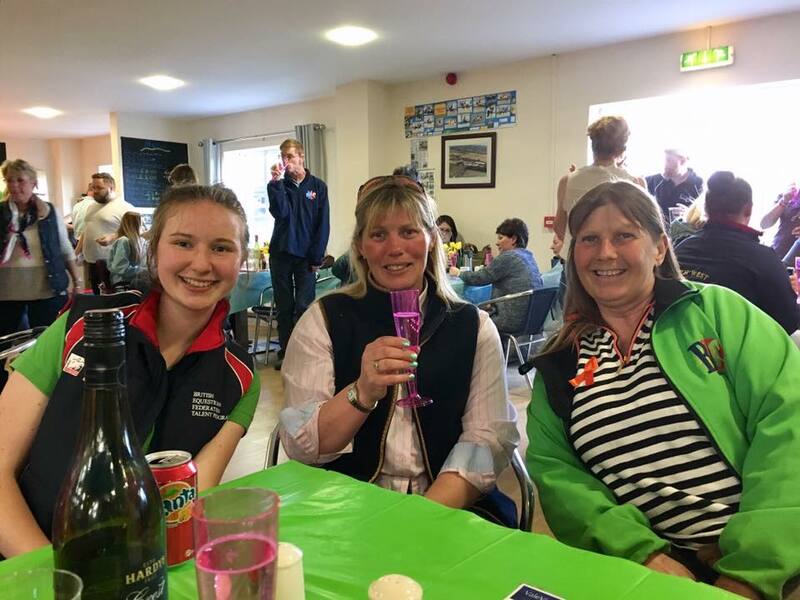 We had one more competition lined up at Hartpury in what was a very busy month, but before heading there we took the opportunity of a training day organised by the Central Region at Fairoak Grange Equestrian Centre with International Para Judge Jayne Peberdy. Jayne was really fantastic and very very easy to work with. 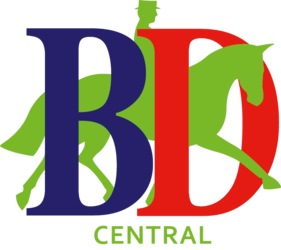 First of all we worked on our general way of going to improve our straightness and impulsion and over all quality before concentrating on shoulder in, which is one of the more tricky bits of the 2017 Grade IV Team Test. It was an excellent session and a reminder to focus on improving the basics before worrying about the fancy bits. 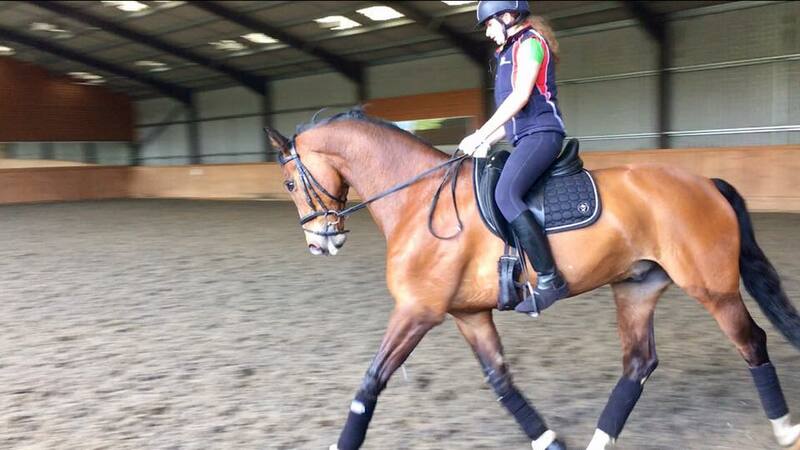 I am very gratefully to Jayne as it really was a lovely session and great preparation for Hartpury the very next day. Another good warm up in the barns at Hartpury, followed by a 67.24% riding the Novice in the International Arena, and we were well prepared for our second team test and first at a major venue. The International Arena at Hartpury College is a fantastic place to compete, and one Aslan seems to like a lot. Aslan took it all in his stride and again I was really pleased with our score of 65.38% resulting in another couple of red rosettes to return home with and the second qualifying school we needed for Bishop Burton. So a great day out and a long one too as this was our first late start time too competing well after four o’clock, so after a proper warm down and a quick de-biref with Sacha (and Aslan) we were loaded and back on the road for the long drive home from Gloucestershire to Buckinghamshire. 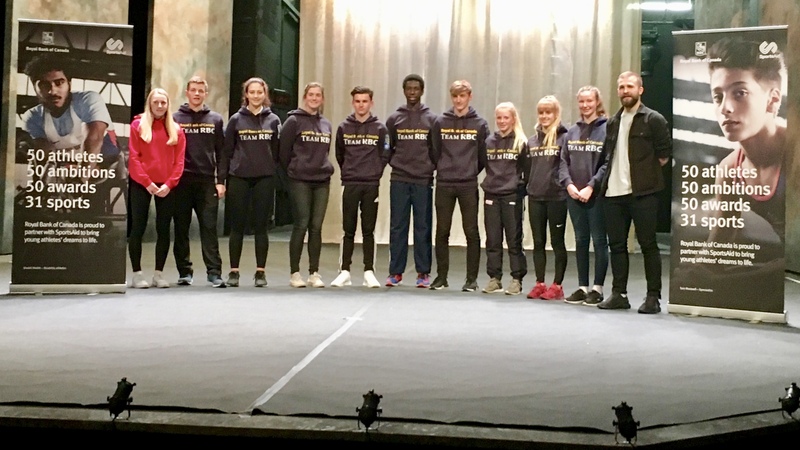 I finished with the month with a very special opportunity to visit the Old Vic thanks to SportsAid and my sponsors the Royal Bank of Canada who organised a communciations workshop at at the Old Vic. It was a great opportunity to work on our communications skills on the Old Vic stage and where Daniel Radcliffe was performing that evening. If the venue wasn’t inspiring enough, I also got to meet three time Olympian and World Champion open water swimmer Keri-Anne Payne. Keri is an amazing athlete who swims 10K in open water in her event. It’s a tough sport and Keri really inspired us and gave us really good practical advice on managing our development and sporting careers too. The whole event was such a great opportunity and one I am very grateful to everyone at SportsAid and the Royal Bank of Canada for arranging. All this and training as normal, gym conditioning on Fridays as well as volunteering at Wendover Heights Vets once a week too. So a very very busy month, and before you know it its well into May which means mock GCSEs for me which is why I’m sending this out later than usual. More of May to come next time, in the meantime thank you to everyone who has supported me through April and I hope you enjoy my blog.